Gold hit its high in 2011 at a bit over $1900. The most recent low was $1,045 in 2015 and currently it stands at around $1,250. 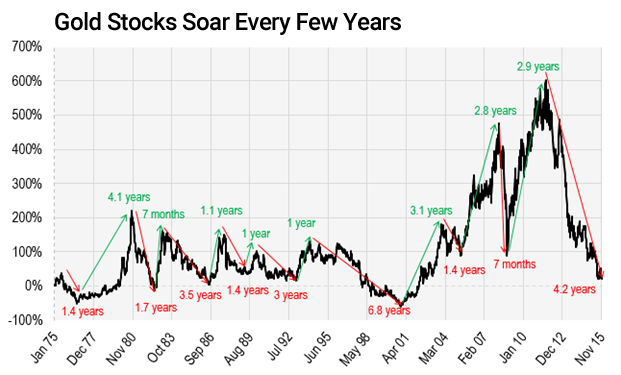 Gold Shares have had an even wilder ride with the average gold stock down up to 70% – clearly not for the faint-hearted investor. No one has a crystal ball and I certainly do not, but the low in gold is close – perhaps this recent rally driven by fear in Europe over the banking sector will not continue past $1,350 and we will see the lows tested one more time before we see the Gold bull market start up again. We are witnessing the beginnings of the new gold bull market and clearly there is more upside now than downside. The previous two up-legs in gold gained 300% and 177%; the previous two up-legs in gold stocks (basis HUI) put on 1,300% and 325%. Over the next while, for those who are patient, GOLD is a buy.